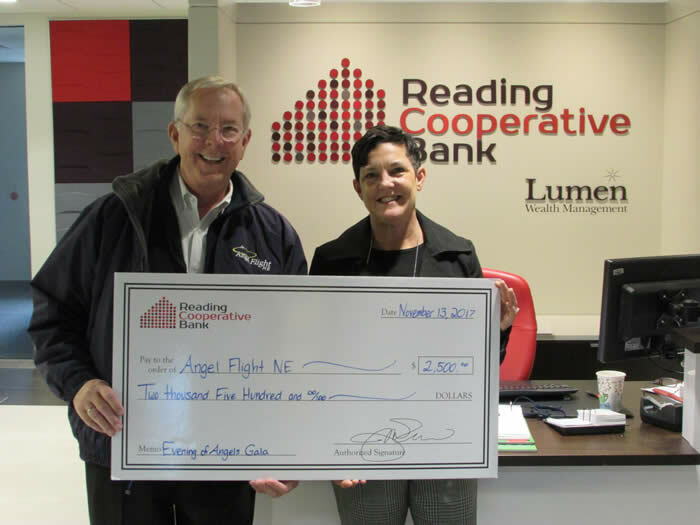 Reading, MA - Reading Cooperative Bank recently supported Angel Flight New England by sponsoring its annual Evening of Angels Gala. Angel Flight NE has been arranging free flights for children and adults in need of medical care for more than 20 years. More than 1,000 volunteer pilots have flown over 13 million miles while providing more than 62,000 patients and their families with free transportation to the medical services they require. “Reading Cooperative has been fortunate enough to have a close relationship with Angel Flight for several years. What they do for their patients is remarkable and there is a lot to be learned from their dedication to serving those who need medical services,” says Julie Thurlow, President and CEO of Reading Cooperative Bank. Angel Flight is a non-profit organization that relies on funding through the support of individuals and businesses across the northeast. Angel Flight will host its 20th Annual Evening of Angels Gala at the Seaport Hotel in Boston, Massachusetts on November 17th. The event will include cocktails, dinner, fundraising, and dancing. The event is a major source of funding for the organization. For more information, to buy tickets, or to get involved please visit angelflightne.org.